Since running has become your latest passion, you figure it might be fun to have the companionship of man's best friend to enjoy the daily trek. Sure, dogs need exercise just as much as their two-legged friends. In fact, staying active is in their DNA. But there are some dog breeds that are just not the right type to pound the pavement with you. Some dogs are too large or even too small, while others risk getting overheated. So before you purchase that cute pink doggie outfit for your Maltese, read on to learn which dog breeds make good running partners. Keep in mind that you don't need a pure bred dog to experience these running traits. These guidelines can apply to predominant breeds in mixed-breed dog as well. But check with your veterinarian for the final word on your particular dog. 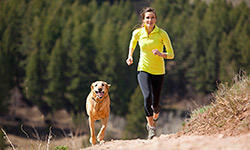 The type of dog you choose also depends on the type of runner you are. If your daily journey consists of a ten mile trek or more, then the following dogs will be able to keep up with you because of their medium build and the muscles in their hind parts: German shorthaired pointers, Goldendoodles, Jack Russell terriers, Weimaraners and Vizslas. If you you're a faster runner who thrives on shorter distances, then the Beagles, English setters, Golden and Labrador retrievers, Greyhounds, and Pit bulls will be your best companions because they too are muscular but are also built for sprints. If you live below the Mason-Dixon line and love to run in the simmering July heat (although running in heat higher than 80 degrees or more isn't recommended), then the Airedale terriers, Fox terriers, and Rhodesian ridgebacks will be able to withstand the heat. They can do this in part because of their long noses and short sleek coats. For those who enjoy running along Lake Michigan during the brutal Chicago winters, bring along your German Shepherds, Malamutes, Siberian huskies, or Swiss Mountain Dogs. No matter what breed you choose, there are other factors that you need to consider when running with Fido. Age is one. Sure puppies are nothing but balls of energy, but remember that their bones are still developing at their tender ages so make sure you clear the idea of running with your veterinarian. You also need to check in with the dog doctor about older dogs to ensure there too are healthy enough to keep up. Also, consider how dangerous hot concrete surfaces can be on your dog's paws. Dogs will let you know if their paws get too hot or if something got stuck in their paws by either limping or licking more than usual. Again, being vigilant is key here. Finally, have plenty of water for both you and your pup. Since dogs don't sweat like humans, you need to keep a watchful eye out on how he's feeling. No matter what breed you own, check in with your vet to make sure your doggie friend will be up for the challenge.